At the WWDC 2009 Phil Schiller, Apple’s SVP of Product Marketing, announced thatthe Macintosh has experienced an explosive growth and even more did the number of OS X users. While in 2007 the number of active users of Apple’s operating system was at 25 millions in 2009 it had suddenly risen to 75 million. How could this be? The secret to Apple’s tripling its active user base in the past two years is the runaway success of the iPhone platform. 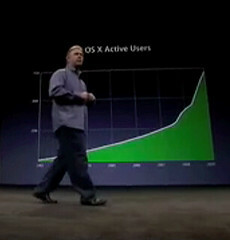 During the keynote presentation Schiller produced a chart showing the number of actual active OS X users, not just of Mac OS X users. It’s very important to strike the difference between those two terms: OS X and Mac OS X. The growth isn’t just about Macs but it ows a lot to the many iPhones and iPod touchs sold so far, to be exact around 40 millions of the devices. Both have a version of the former Mac OS X and of its technologies and have thus incremented the market share of Apple’s operating system and key programs such as the web browser Safari.